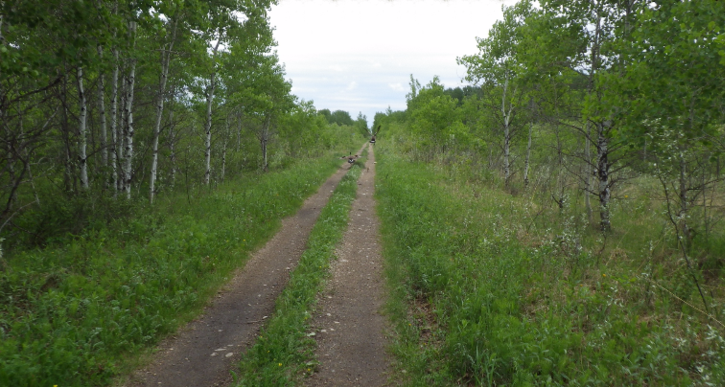 The Interlake Pioneer Trail (IPT) is something the club is very proud of and it wants to see more of these trails in the future; members are actively working toward this goal along with the other ATV clubs around the province. Andrew Hardie has been chairman of the SIATV Club for a year now but has been a member for five years. Other clubs currently have non-recognized trails, according to Hardie, but they are all working hard on getting more ATV trails solidified. But even though there is only one designated trail, it doesn’t mean there is a lack of ATVing fun to be had in southern Manitoba. The IPT is about 71 miles long and runs from South Interlake all the way up to Fisher Branch. There are a variety of ecosystems along the trail—from wetlands, green areas and a few dusty spots to places with lots of trees. The trail takes riders through several communities too. The IPT is a multi-use trail, so it’s set up for ATVs, walkers, horseback riders and cyclists. The trail is open to ATVs from May 1 to October 31 each year, while from November 1 to April 30, the IPT is a Snoman trail. Because there are so many snakes, a lot get killed on the roads. That’s why there have been little wildlife passes set up for them, just as there are for bigger mammals on highways. There are small culverts that run under the roads with fencing to guide the snakes to the culvert passes. The trail has many information boards set up along the way to educate riders about the area and its wildlife and vegetation. The IPT is also home to a large number of geocaches. Suzanne Otte, treasurer for the SIATV Club, helped set up more than 30 geocaches during the summer of 2011 with the assistance of the children at Garden Grove Child Care. Geocaching is a real-world, outdoor treasure-hunting game using GPS-enabled devices. Participants navigate to a specific set of GPS co-ordinates and then attempt to find the cache hidden at that location. Otte said there will be even more geocaches to search for this summer—it’s a wonderful way to enjoy the trail. On June 22, 2013, the SIATV Club will hold its annual Iron Man Ride. Riders from this club and others, as well as ATV Manitoba executive members, all get together to ride the entire length of the IPT and back. This particular ride is not for raising money. Instead, its importance lies in providing the opportunity for ATVers to go out and ride and get to know people in other clubs. Hardie said SIATV Club members want to show others their trail and invite them back anytime. It’s a great way to establish new relationships. The club is also hosting its first annual ATV Ride for Dad in September. The event raises awareness and funds to battle prostate cancer.